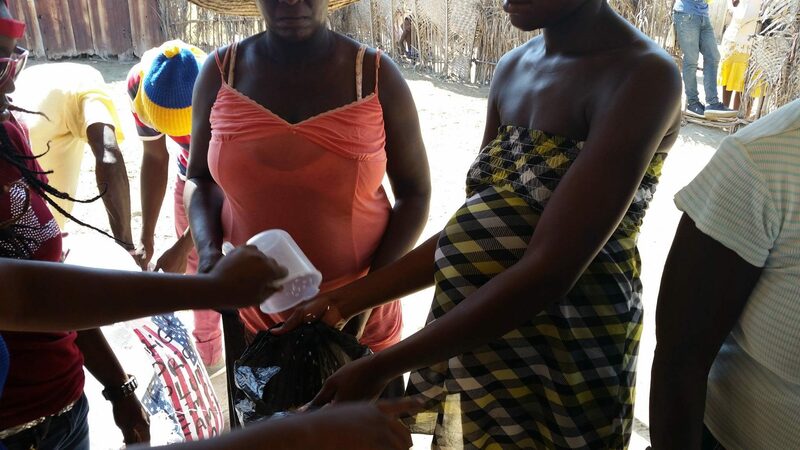 In simplistic terms, we offer aid to the suffering families of Haiti so that they may have relief, receive a blessing and have a fighting chance for tomorrow as a direct result of our programs and your kindness…. In furtherance of our mission and Church advancement which is the advancement of the body of Christ, we provide aid to the suffering people of Haiti so that they may have relief from the afflictions they suffer. We show them the goodness of Christ through grace and mercy as the Lord has certainly shown us the same. One of the many things we’ve learned over the last few years is that it’s hard to preach the gospel of Jesus Christ over the sounds of growling stomachs. The food, medical aid and other initiatives that we promulgate not only provide direct relief to families but it also makes them more fertile to hear and receive the word of God. So that they may repent for their sins, confess Jesus Christ as their Lord and savior and then be baptised in the mighty name of Jesus Christ. We do what we do so they may be saved from the lake of fire, have everlasting life, put on the whole armour of the Lord Eph 6:11 “Put on the whole armour of God, that ye may be able to stand against the wiles of the devil.” and then begin to walk in his authority and power from on high. 2 Corinthians 10:4 For the weapons of our warfare are not carnal, but mighty through God to the pulling down of strongholds. We give them a hand up and not a hand out. Because how does one pull himself by his bootstraps when he doesn’t even own a pair of boots? We help our brothers and sisters in Haiti so that they may have an opportunity to help themselves. We don’t know about you but when we’re really hungry and haven’t eaten in a few hours of just one day, we can’t even think straight in relatively minor situations. So we can only imagine what that’s like when you haven’t eaten in several days. Thus, we show mercy and “lift our fingers to help” Luke 11:46 “Woe to you as well, experts in the law!” He replied. “You weigh men down with heavy burdens, but you yourselves will not lift a finger to lighten their load. We provide help for needy in accordance with Matthew 25:40 AND JESUS SAID, ” I tell you the truth, what you did for the last of these brothers you have also done for me”. But why do your actions have to be ``in the name of Jesus Christ``? Because we are a Christian organization. We operate on Christian principals and do everything we do to bring and honor and glory to God’s Holy name. We strive to do our work in direct reflection of him so that his will be done. We operate under and place Jesus Christ at the forefront of all we do and recognize it as the source of power from on high because the scripture says Philippians 2:9 “Therefore God also has highly exalted Him and given Him the name which is above every name, 10 that at the name of Jesus every knee should bow, of those in heaven, and of those on earth, and of those under the earth, 11 and that every tongue should confess that Jesus Christ is Lord, to the glory of God the Father. So when we need hunger, depression, sickness, oppression and anything contrary to the power of the Most High to bow down, kneel, submit and be destroyed, we call on the one name above all names, Jesus Christ. The All Power In His Hands Team goes directly into the communities with our resources and ensures that we have a direct and meaningful impact with the resources you kindly provide. There are no middle men, there’s no red tape, no excuses and quite frankly no bufoonery when it comes to the administration of our programs. We are accountable and administer strict accontability standards to everything we do.